To find some really heavy soul in Detroit you have to look to the lesser label names. 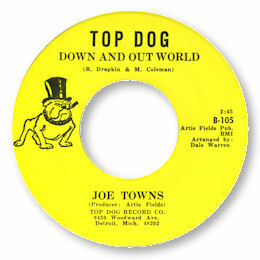 Artie Fields' Top Dog had one such performer on its books - Joe Towns. Standing head and shoulders above all his other tracks was the waltz time Down And Out World featuring a rather military style opening and an excellent false ending. But the real joy of this track is Joe’s astonishing vocal – check out those falsetto work outs as he gets into the doomy lyric. The midtempo flip is pretty good too but try "Look Around And You'll Find Me" for another showcase for his vocal pyrotechnics. UPDATE ~ Japanese expert Katsuaki Sano writes with new information on a further 45 by Joe Towns - TOP DOG 106 which I have now added to the discography. He says the top side "is good melodic midtempo". I'm grateful to him for writing.